Does it ever feel like having to repay your student loans is so far off that it is hard to even think about it? There are so many fun things and life plans to make that college graduates don’t want to be reminded that at least a decade of making student loan payments is not far off in their future. One approach is to do nothing, wait until the notices arrive, and then make a mad scramble to figure out a payment plan, but that obviously has a few drawbacks. A slightly saner approach would be to look the situation straight in the eye, study your options, and make choices that are best for your individual circumstances. In fact, the U.S. Department of Education has provided a number of must-dos that will help you make a student loan payment plan and stick to it. Here are a few of their recommendations for dealing with your federal student loan debt, but most of these suggestions apply to private student loans as well. You can’t possibly develop a realistic budget until you know the amount of money you will be expected to pay on a monthly basis. Once you have this information in place, you can compare it against your anticipated income and expenses to determine if you might run into a shortfall. Federal Student Aid (FSA) has a payment calculator you can use to calculate payment amounts under different payment plan options. If you have private student loans, many of them also offer similar payment estimators so you should be able to calculate the total payments you will be making. With federal student loans, you have a choice of payment plan options but you have to let your loan servicer know that you will be participating in one of these plans. Otherwise, you will be automatically enrolled into the standard 10-year repayment plan, where the monthly payments might be a little higher than you will actually be able to afford. Other student loan repayment plans can extend the payment period, gradually step up the amount due, or develop a payment schedule based on your earning capability. If you choose one of the income-based repayment plans, you will have to keep in touch with your loan servicer regarding your income. You can also choose to have your loan servicer determine which income-based plan is best for you. Just be aware that any of these options might end up costing you more in total payments over the long run. 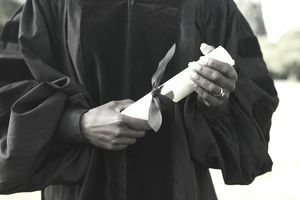 If you plan on going into public service, you need to know that the Public Service Loan Forgiveness (PSLF) Program will forgive the remaining balance on your Direct Loans after you have made 120 qualifying monthly payments under a qualifying repayment plan while working full-time for a qualifying employer. In this case, it might make sense to apply for one of the income-based repayment plans, depending on the amount of income you expect to earn. To help determine if you are meeting the requirements to qualify for this program, you should periodically submit an Employment Certification for Public Service Loan Forgiveness form. After you make 120 qualifying monthly payments, you will need to submit a PSLF application. Over the course of four years, you may have taken out multiple student loans from multiple servicers. It can be difficult keeping track of all the paperwork and payments. It might make sense to consolidate your federal student loans into a single monthly payment. You need to apply for a Direct Consolidation using either an electronic or paper option. The total application process takes about 10 minutes. You may also want to consider consolidating your private student loans into one loan as well. Can You Make Payments Automatically? If you have a bank account that you can set up to make automatic payments, you could be eligible to receive a 0.25 percent interest rate deduction on your federal student loans when you enroll. Ask your loan servicer if this option is available.